The Iron Lady is worth watching for Streep's almost certainly Oscar-bound performance, but the patchy script lacks both dramatic and emotional weight, while viewers of a certain age may resent being made to feel sorry for Margaret Thatcher. 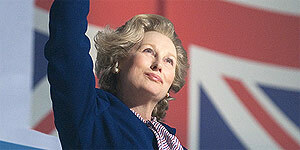 Directed by Phyllida Llloyd and written by Abi Morgan, The Iron Lady is a (sort-of) biopic of former Prime Minister Margaret Thatcher. It opens in present-day London, with an ageing Baroness Maggie (Meryl Streep) battling dementia and conjuring up the delusion that Denis (Jim Broadbent) is still alive and talking to her, which triggers memories of her life and career. Needless to say, Meryl Streep is extraordinary, delivering a note-perfect and almost certainly Oscar-bound performance that's chillingly accurate and may give you unwelcome flashbacks. There's also strong support from Broadbent (essentially reprising his role from Iris, which The Iron Lady closely resembles) and particularly from Olivia Colman (excellent and almost unrecognisable as Carol Thatcher), while Anthony Head and Richard E Grant are amusingly cast but sadly under-used as Geoffrey Howe and Michael Heseltine, respectively. To put it glibly, the main problem with the film is that there's too much Alzheimer's and not enough politics – none of the potentially fascinating political dramas are explored in any great depth and the patchy script feels both rushed and shallow as a result. It also feels frustratingly one-sided (you get no sense of why she was one of Britain's most hated Prime Ministers), while the present-day dementia scenes occasionally feel uncomfortably manipulative and you can't help wishing the film had taken a leaf out of The Queen's book and focussed on a single episode in her career instead. The Iron Lady is worth seeing for Streep's typically brilliant performance, but it ultimately fails to satisfy on either an emotional or a dramatic level.